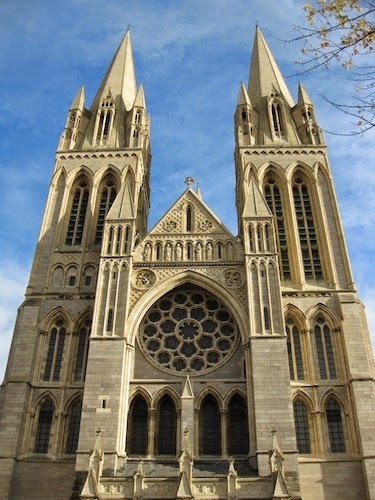 We are very lucky at Cornwalls Cottages to have our offices based in the beautiful cathedral city of Truro. Actually we can look out of the window and see the three magnificent spires towering over the city centre. Truro has managed to retain its charm with lovely cobbled streets and parts of the centre are a car free zone. Strolling down Pydar Mews is such a treat where fabulous gifts and jewellery can be had or wandering through Walsingham Place with its beautiful Georgian terrace. Not only does Truro have many of the usual high street chain stores (M&S, Debenhams, The White Company, Monsoon etc) we also have a unique blend of boutique and independent shops. For those of us lucky enough to work here we are surrounded by a city steeped in history, architecture, art, culture, bars and restaurants. Every Wednesday there is a Farmers Market on Lemon Quay with some amazing stores offering olives, to curry, a fishmonger and freshly baked breads, pasties and cakes. We had our best ever staff party at Sams in the City who offered a fantastic menu with great food, and we've all been back with friends and family. There are coffee shops galore, pubs and restaurants like Chantek an award winning Thai restaurant and the Falmouth Bay Seafood Café offering a champagne, oyster and seafood bar. Not to mention Manning’s that have a fabulous cocktail menu. We can thoroughly recommend the mojito’s. There is more than enough to keep you busy for a day in Truro. Catch a play, ballet or musical at The Hall for Cornwall or wander through the Royal Cornwall Museum for a touch of art or to see the remains of an Egyptian mummy. Visit our Victoria Gardens at the foot of the viaduct complete with its own bandstand and fountain or catch glimpses of the Allen River behind the Cathedral and St Mary’s street. Why not stay at one of our many lovely properties situated in and around Truro and take advantage of all this beautiful city has to offer. See our website for more details. It's fascinating, I've never heard about gypsy jazz. I would love to learn more about this style of jazz music. I want to find concert tickets on ticketselect to visit a jazz concert.